Your website users-visitors, staff, students – have to navigate and understand the pages, applications and documents you provide. Many have problems with reading, such as dyslexia. How you can help them get what the need, avoid having to implement costly workarounds, and ensure your investment in your online presence meets quality and accessibility standards? Claro Website Reader brings up a reading toolbar on any page in your users’ web browser. The toolbar reads out any text on the page using good-quality synthesised speech in a range of accents and languages and highlights the text as it goes so the user can see where they are. If the user has a mouse, they can also just highlight any passage to hear it read aloud. 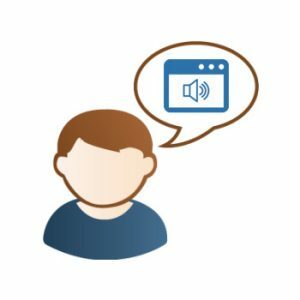 This is a huge help for users who struggle with reading and comprehension: first, they can hear any text read aloud to help with understanding, and second, they can independently have it read aloud again and again until they get it. More useful, more independence! Works on any modern browser – Chrome, Safari, Edge – on any modern device – Windows, Mac, Chromebook, iPad and iPhone, Android. Supports many major languages, including English, German, Spanish, Italian, French, Portuguese, Japanese and Chinese. Activate with a simple button click or automatically, all styled as your website requires. Stays on (or off) as users traverse your website, no need to reload for each page. Simple click to close so users are not stuck in a special “accessibility mode”, reducing frustration. Current Google Chrome, Microsoft Edge, or Apple Safari browser. Click or tap here to check it out on our website! Claro Website Reader is included in any of our Site Licence options, ranging from £495 for ClaroRead SE upwards. Check out or Site Licence options! Claro Website Reader Help – Claro Website Reader is a toolbar that you can install on your website to provide accessibility option. Release Notes – Works on any modern browser – Edge, Firefox, Chrome, Safari, iOS, Android.